Purpose: There are reports of greater survival rates in nonsmall cell lung cancer (NSCLC) patients of female gender. 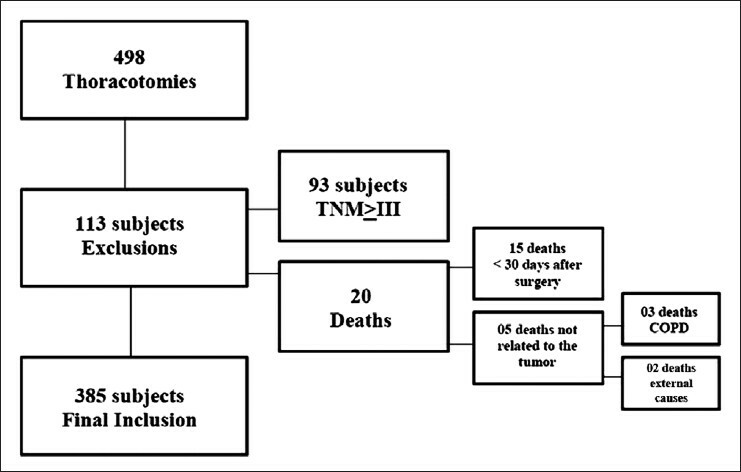 The objective of this study was to evaluate the role of gender in survival of NSCLC patients treated surgically with curative intent (stage I/II). 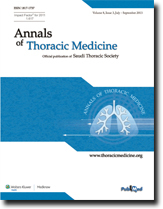 Methods: In a retrospective cohort design, we screened 498 NSCLC patients submitted to thoracotomies at the hospital Sγo Lucas, in Porto Alegre, Brazil from 1990 to 2009. After exclusion of patients that did not fit to all the inclusion criteria, we analyzed survival rates of 385 subjects. Survival was analyzed using the Kaplan-Meier method. The Cox regression model was used to evaluate potential confounding factors. Results: Survival rates at 5 and 10 years were 65.3% and 49.5% for women and 46.5% and 33.2% for men, respectively ( P = 0.006). Considering only stage I patients, the survival rates at 5 and 10 years were 76.2% and 55.1% for women and 50.7% and 35.4% for men, respectively ( P = 0.011). No significant differences in survival rates were found among stage II patients. Conclusions: Our results show female gender as a possible protective factor for better survival of stage I NSCLC patients, but not among stage II patients. This study adds data to the knowledge that combined both genders survival rates for NSCLC is not an adequate prognosis. Objective: To evaluate tuberculosis (TB) incidence rates and trends over a period of 20 years (1991-2010) and assess the impact of the National TB Control Program (NTP) on incidence trends. Methods: This is a retrospective study of TB surveillance data reported by the Ministry of Health. We evaluated TB incidence data by nationality, age, and region of the country and assessed incidence trends over 20 years of study. Chi-squared test was used to assess trend change and its significance. Results: There were a total of 64,345 reported TB cases over the study period. Of these 48% were Non-Saudis. TB annual incidence rate ranged between 14 and 17/100,000. For Saudis, the rate ranged between 8.6 and 12.2/100,000. Non-Saudis had 2-3 times higher incidence. 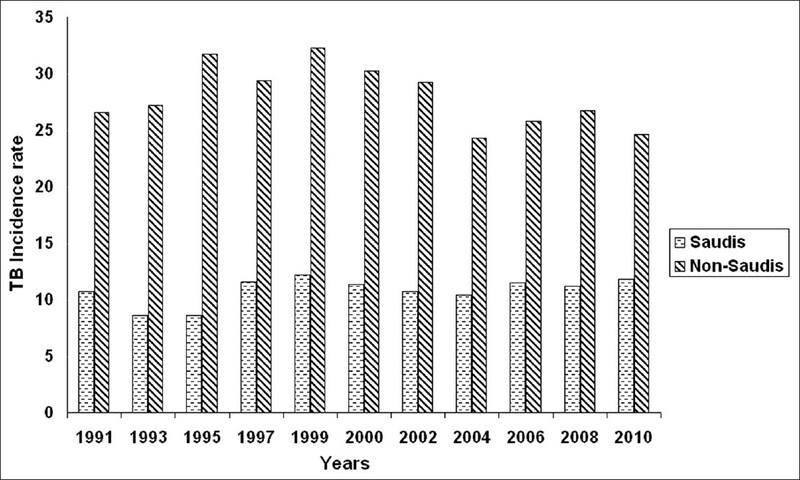 Disease trend was rising over the first 10 years of the study period then it started to fall slightly. The incidence increased with age, but only people older than 45 years showed a declining trend. Regional variations were observed. Makkah and Jazan regions had the highest incidence rates. Disease trends were rising over the last 10 years in Makkah and Central regions. Conclusion: TB control seems to be facing some challenges in several regions of the Kingdom. NTP needs to evaluate and improve TB control strategies in order to reduce disease incidence to elimination levels. Introduction: Fiber-optic bronchoscopy (FOB) with bronchoalveolar lavage (BAL) is a common procedure performed in immunocompromised patients with undiagnosed pulmonary pathology. Identifying patients with the highest potential diagnostic yield may help to avoid morbidity in patients unlikely to benefit from the procedure. We sought to determine which patient factors, specifically chest computed tomography (CT) findings, affected diagnostic yield of BAL. Methods: Retrospective chart review of immunocompromised patients who underwent FOB with BAL from 01/01/2010 to 12/31/2011 at an academic medical center was performed. The lung lobe lavaged, characteristics of pulmonary infiltrate on radiograph, patient symptoms, and diagnostic yield were collected. A positive diagnostic yield was defined as a positive microbiological culture, finding on cytopathologic staining, diffuse alveolar hemorrhage, alveolar eosinophilia or a positive immunologic or nucleic acid assay. Results: The overall diagnostic yield was 52.6%. 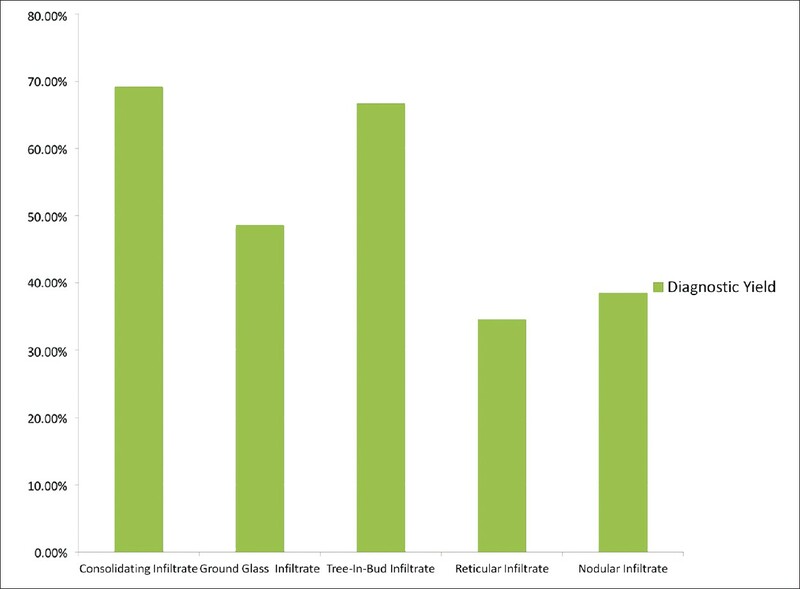 Infiltrates that were predominantly reticular or nodular by CT had a lower diagnostic yield than predominantly consolidated, ground-glass, or tree-in-bud infiltrates (36.5% vs. 61.2%, P = 0.0058). The diagnostic yield was significantly improved in patients with both fever and chest symptoms compared to patients without symptoms (61.3% vs. 29.6%, P = 0.0066). Conclusion: CT findings of reticular and nodular infiltrates portend a worse diagnostic yield from BAL than those that are alveolar in nature. 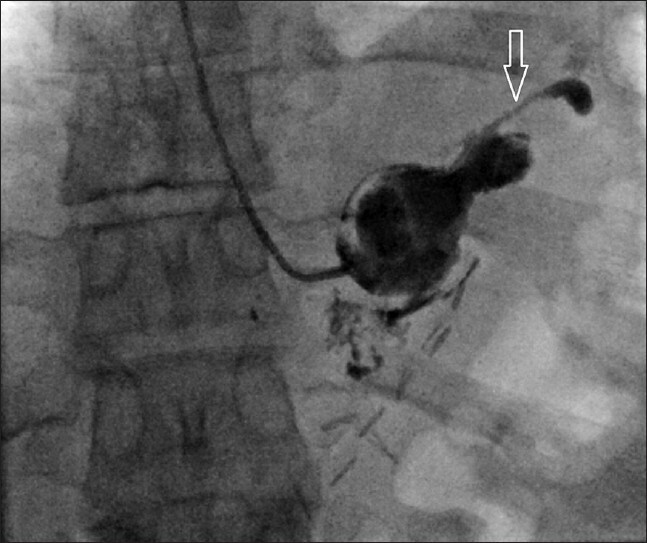 Symptomatic patients are more likely to have diagnostic FOB with BAL than asymptomatic patients. Aims: To investigate the surgical approach and outcomes, as well as prognostic factors for pulmonary metastasectomy. Methods: Clinical data of 201 patients treated by pulmonary metastasectomy between January 1990 and December 2009 were retrospectively reviewed. One hundred thirty three patients were received an approach of thoracotomy while 68 with video-assisted thoracoscopic surgery (VATS). There were 54 lobectomies, 139 wedge resections and 8 pneumonectomies. Hilar or mediastinal lymph nodes dissection or sampling was carried out in 38 patients with lobectomy. The Kaplan-Meier method was used for the survival analysis. Cox proportional hazards model was used for multivariate analysis. Results: The 5 years survival rate of patients after metastasectomy was 50.5%, and the median survival time was 65.9 months. The median survival time of patients with hilar or mediastinal lymph nodes metastasis was 23 months. By univariate analysis, significant prognostic factors included disease-free interval (DFI), number of metastases, number of affected lobe, surgical approach (open vs. VATS) and pathology types. DFI, number of metastases, and pathology types were revealed by Cox multivariate analysis as independent prognostic factors. Conclusion: Surgical resection of pulmonary metastases is safe and effective. Palpation of the lung is still seen as necessary to detect the occult nodule. More accurate and sensitive pre-operative mediastinal staging are required. Background: Didactic lectures are frequently used to improve compliance with practice guidelines. This study assessed the knowledge of health-care providers (HCPs) at a tertiary-care hospital of its evidence-based thromboprophylaxis guidelines and the impact of didactic lectures on their knowledge. Methods: The hospital launched a multifaceted approach to improve thromboprophylaxis practices, which included posters, a pocket-size guidelines summary and didactic lectures during the annual thromboprophylaxis awareness days. A self-administered questionnaire was distributed to HCPs before and after lectures on thromboprophylaxis guidelines (June 2010). The questionnaire, formulated and validated by two physicians, two nurses and a clinical pharmacist, covered various subjects such as risk stratification, anticoagulant dosing and the choice of anticoagulants in specific clinical situations. Results: Seventy-two and 63 HCPs submitted the pre- and post-test, respectively (62% physicians, 28% nurses, from different clinical disciplines). The mean scores were 7.8 ± 2.1 (median = 8.0, range = 2-12, maximum possible score = 15) for the pre-test and 8.4 ± 1.8 for the post-test, P = 0.053. There was no significant difference in the pre-test scores of nurses and physicians (7.9 ± 1.7 and 8.2 ± 2.4, respectively, P = 0.67). For the 35 HCPs who completed the pre- and post-tests, their scores were 7.7 ± 1.7 and 8.8 ± 1.6, respectively, P = 0.003. Knowledge of appropriate anticoagulant administration in specific clinical situations was frequently inadequate, with approximately two-thirds of participants failing to adjust low-molecular-weight heparin doses in patients with renal failure. Conclusions: Education via didactic lectures resulted in a modest improvement of HCPs' knowledge of thromboprophylaxis guidelines. This supports the need for a multifaceted approach to improve the awareness and implementation of thromboprophylaxis guidelines. Objectives: This study compares early and late outcomes for treatment by video-assisted thoracic surgery (VATS) versus treatment by thoracotomy for clinical N0, but post-operatively unexpected, pathologic N2 disease (cN0-pN2). Methods: Clinical records of patients with unexpected N2 non-small cell lung cancer (NSCLC) who underwent VATS were retrospectively reviewed, and their early and late outcomes were compared to those of patients undergoing conventional thoracotomy during the same period. Results: VATS lobectomy took a longer time than thoracotomy (P < 0.001), but removal of thoracic drainage and patient discharge were earlier for patients in the VATS group (P < 0.001). There was no difference in lymph node dissection, mortality and morbidity between the two groups (P > 0.05). The median follow-up time for 287 patients (89.7%) was 37.0 months (range: 7.0-69.0). 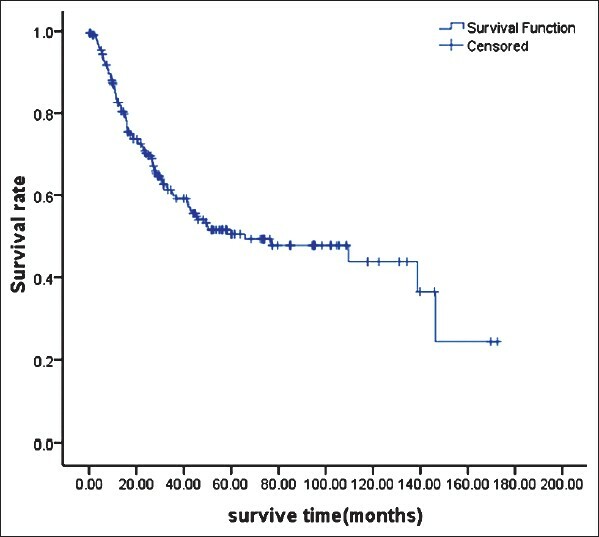 The VATS group had a longer survival time than for the thoracotomy group (median 49.0 months vs. 31.7 months, P < 0.001). 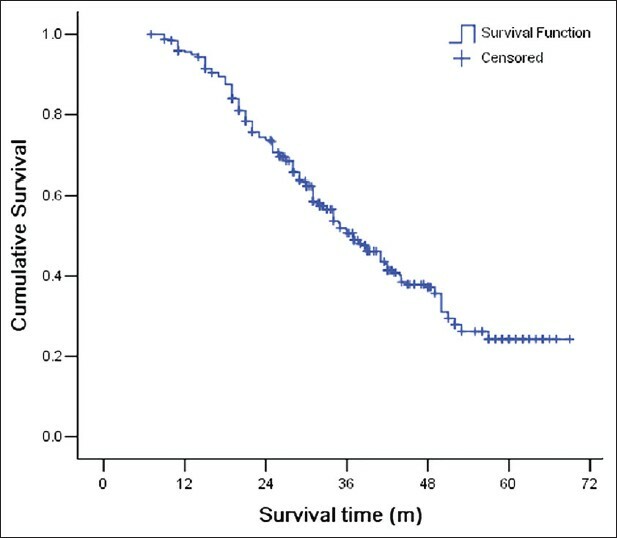 The increased survival time of the VATS group was due to patients with a single station of N2 metastasis (P = 0.001), rather than to patients with multiple stations of N2 metastasis (P = 0.225). Conclusions: It is both feasible and safe to perform VATS lobectomy on patients with unexpected N2 NSCLC. VATS provides better survival rates for those patients with just one station of metastatic mediastinal lymph nodes. 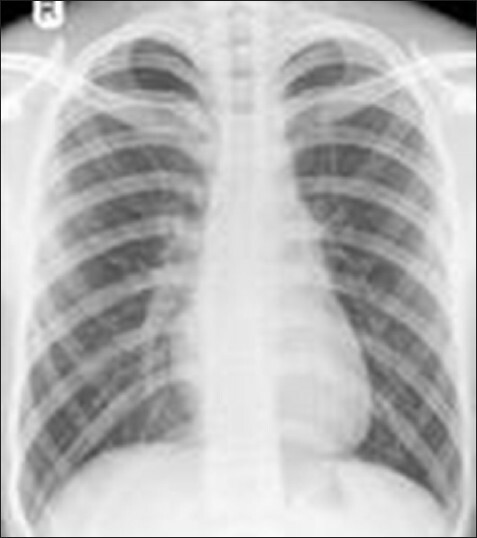 We describe two cases of spontaneous pneumothorax in young healthy adults with no underlying structural lung disease. The onset of pneumothorax was following physical activity including playing musical instruments and blowing of balloons. There is sparse data evaluating the pathophysiology of primary spontaneous pneumothorax in relation to increased mouth pressures. These cases highlight the possible physical effect of valsalva manoeuvre on transpulmonary pressures, and the potential risk of developing pneumothorax in otherwise healthy individuals. This aspect of pneumothorax development is worthy of further exploration, to better elucidate the mechanism and enhance our understanding of this common respiratory presentation. Gastrobronchial fistula is a rare but serious complication of laparoscopic sleeve gastrectomy with significant morbidity and mortality. We present the case of a 30-year-old man who underwent laparoscopic sleeve gastrectomy for morbid obesity and presented later with a history of chronic productive cough. Upper gastrointestinal series showed the presence of a communicating fistula between the stomach and the left lung bronchial tree.